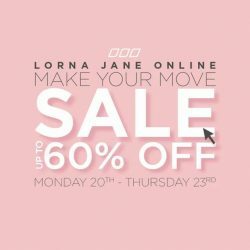 Till 26 Sep 2018 Lorna Jane: Get $30 OFF Women’s Activewear Online with BQ’s Exclusive Coupon Code! *Full price purchases only, offer ends 26 Sep 2018. Get fit in stylish and high performance women's activewear from Lorna Jane! Lorna Jane sports bras provide maximum support with comfort and breathability. Their tights are designed in different styles and fabric, which is why a pair of tights is sold every 60 seconds! Shop now for new workout outfits to inspire yourself to exercise! Remember to use our exclusive coupon code to save on your purchase! Shop 30% off selected styles for 30 hours! Look great and feel great, Lorna Jane activewear & sportswear is now on 30% off selected pieces. Get fit in style! We're sooo excited to meet you Singapore! Come visit us and enjoy 20% off from now til next Friday to celebrate with us! We're now located at 4 Ann Siang Hill #01-01 (right off South Bridge Road) for all you CBD shoppers! 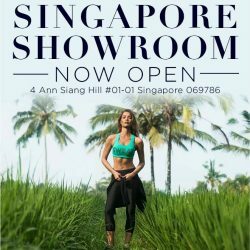 Come check us out every Monday to Friday from 12-7pm (we are closed for Hari Raya Puasa) & enjoy a fun styling session with our Active Stylists! Our Make Your Move Sale has landed online! Get ready to shop up to 60% OFF some amazing styles!